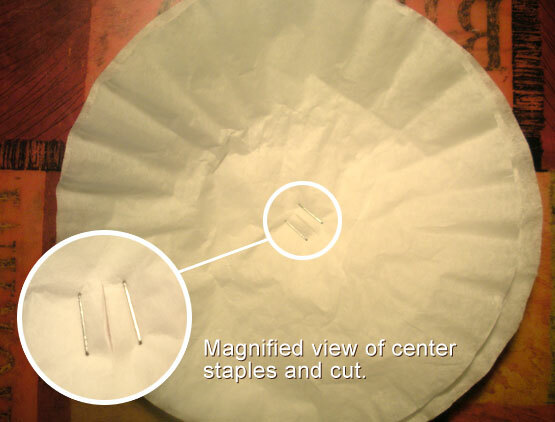 Back when I did this original post Reception Tent DIY: Coffee Filter Pom-Pom How-to, I had promised some pictures of the pom-pom's at the wedding. Unfortunately, the lighting at the time when we did setup and had time to take our own pictures, was a little sharp. 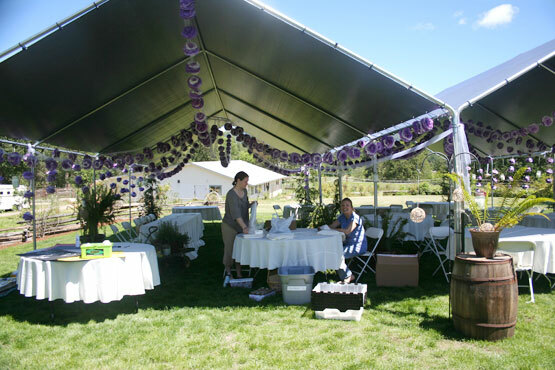 These were the dreadful tents we had to work with, but it worked out. The reason for the revisit is that I had many many people contact me via COLOURlovers, facebook and twitter for more detailed information to assemble these things. I dumbed it down and made a process that worked great and pretty efficient I must add. I have omitted the details of dying the filters (to add colour) because that's something in itself and was covered a bit in the last post. I will also do an immediate follow-up post on different variations on what I found worked, to add colour to the pom-pom's. Trust me when I say that this step matters. 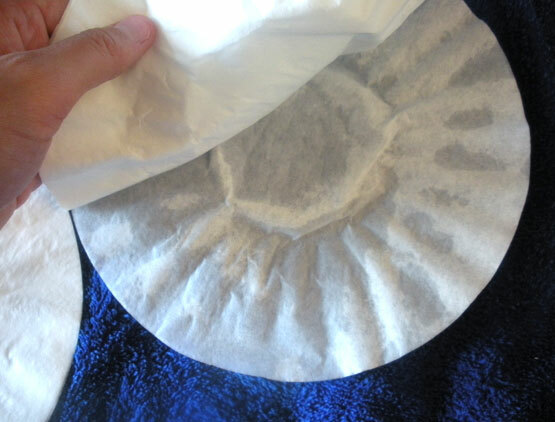 Prepping your filters for scrunch is highly important as they will just turn in to floppy filters within an hour (or less) after ONLY hand scrunching. I spent an entire afternoon with trial and error to nail down the best method for best final results in the most time-efficient manner. You'll be starting with plain white or brown coffee filters straight from the package (LEFT) which is a baby-soft creased circle. We want the crinkly, crusty, rough final wrinkles and all (RIGHT). It's like reverse fabric softening. If you don't believe me, try hand-crinkling a handful of filters straight from the package and see how long it takes to get floppy and flat. START by separating a section of filters. Using rubber kitchen gloves will make this a lot easier/faster. You'll get better results by separating them as they come pretty compressed in stacks. Separate and re-stack in stacks of about 10-20. NEXT Have your towel laid out and folded in half (so that you have some extra padding). 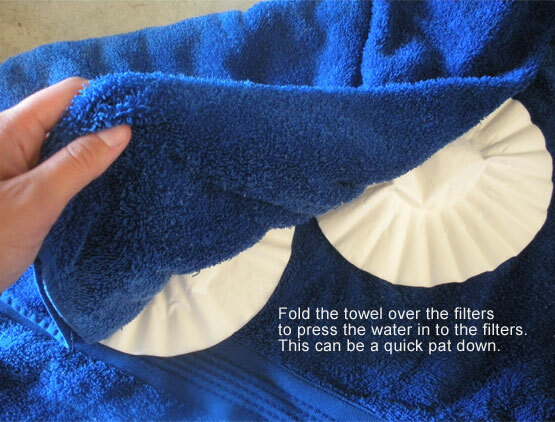 You'll be folding one end of the towel over the filters in this step. Either pre-dampen your towel just slightly or spray it down heavily with your spray bottle (only the interior where the filters are). Place about four stacks or so on half the towel. Spray water over them over them, about a medium coverage. They don't need to be absolutely soaked, but damp enough to tell they are wet. 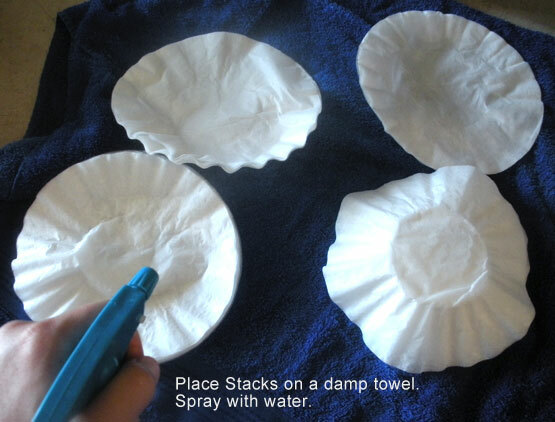 Fold the towel over and press the water in to the filters. This can be a quick step, you don't need to be too through, just make sure they are getting wet. you can tell. For example, BELOW you can see which parts of the filter is wet or not. The right side could be a little more damp if you need to re-spray some sections, do so and re-press. If your stacks are too thick, you may also need to split them up. NOW toss the damp stacks in the dryer - try to discombobulate them a little so that they aren't stuck in their stacks or you may have to re-do. I grabbed each stack and flopped them back and fourth and tossed them roughly in to the dryer to scatter them. If you get to a point where they are all dry but still looking the same, try just spraying over them in the dryer and re-dry then keep that in mind when you're getting the next set ready. I'm always nervous about burning down the house so I started on low, but HIGH temp also worked fine after I got too impatient. Just do a couple of runs checking every five minutes to see how much time at what temperature will work for you. Everyone has a different type of dryer. 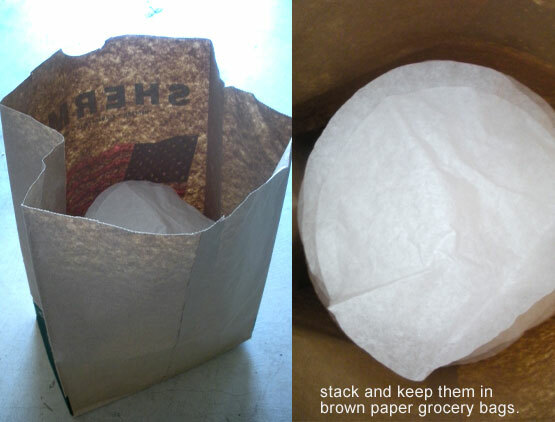 When you've got a batch that looks good and crinkly, stack them in brown grocery bags, I found that was the best way to organize them. Flatten, but don't actually try to press them out because you want to retain the wrinkles. 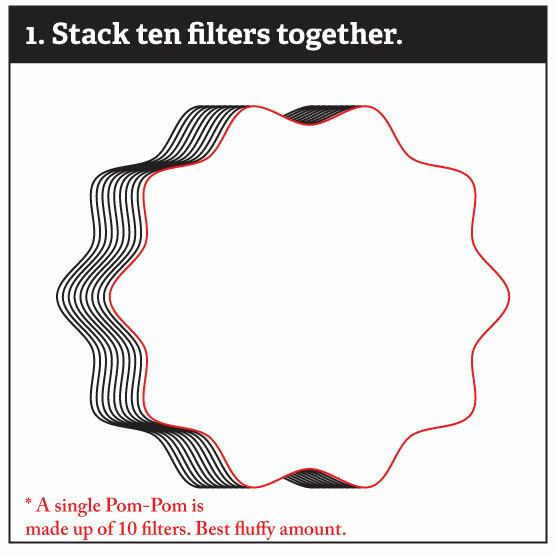 Organizing them in the paper bags helps make the next process of making the pom-pom's faster as you will be making stacks of 10 for each pom-pom. 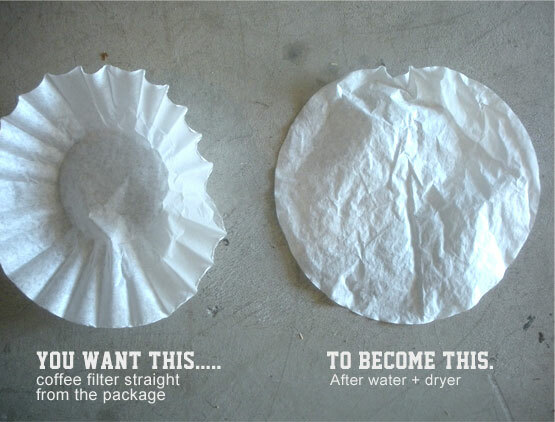 So that's the first part of making your Coffee Filter Pom-Pom's. 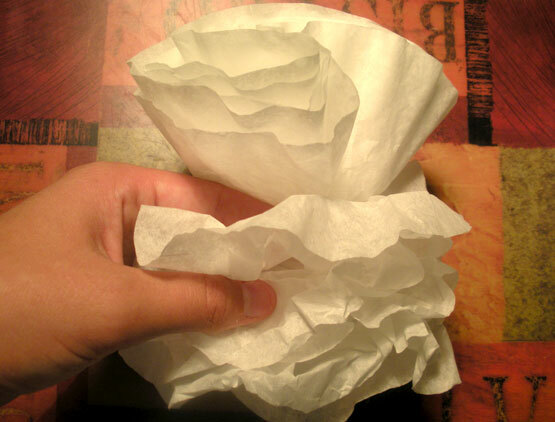 Notes to ponder: Getting them wet and tossing them in the dryer is the entire technique to getting a great scrunch. Don't soak the filters in water, you'll just be creating more work for yourself. Also, I did test out a few other methods to get this done quicker. I tried throwing a wet/damp towel in to the dryer with filters straight from the package. It wasn't very efficient because it would have taken ages longer in the dryer for everything (filters AND towel) to dry. The towel was keeping the filters it did get wet, wet and didn't even get others wet. So the spray water method seemed to work the best, quickest. Work efficiently by working in the laundry room/area if you can. You can do all this on and in the dryer. Set your towel station up on top of the dryer or by a nearby table. While one batch is in the dryer, work on wetting the next batch. Moving on. Now you've got to assemble the pom-pom. Like I was saying, I had a lot of requests on how to make these. Hopefully these visual details help explain it a little better. I put together an easy PDF guide for everyone to print which might come in handy if you're going to have a large group of people helping you with this. 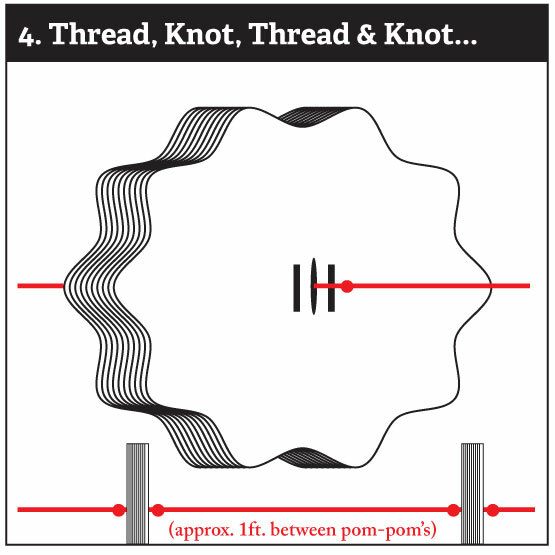 NOTE: String about 6-8 feet measurements of pom-pom's. 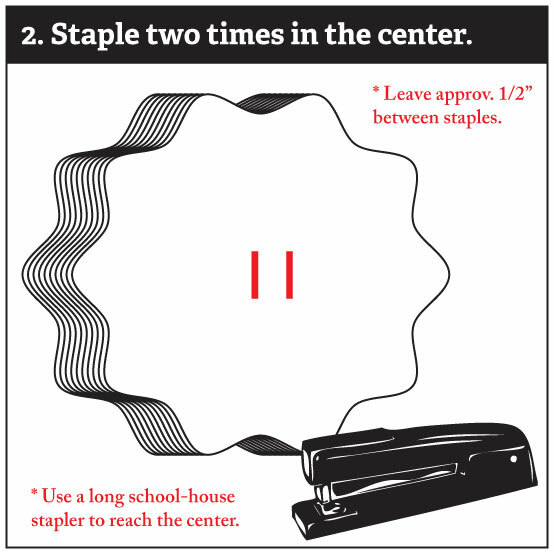 When you get to setup day, you can easily tie the sections together in whatever length you will need. Now you can start scrunching the first layer-filter. Start by scrunching-gathering a section and work your way around like your'e crimping pie around the edge (if you're familiar). Keep scrunching, it's not a work of art so don't be delicate with it. The filters are SUPER sturdy too so be rough. 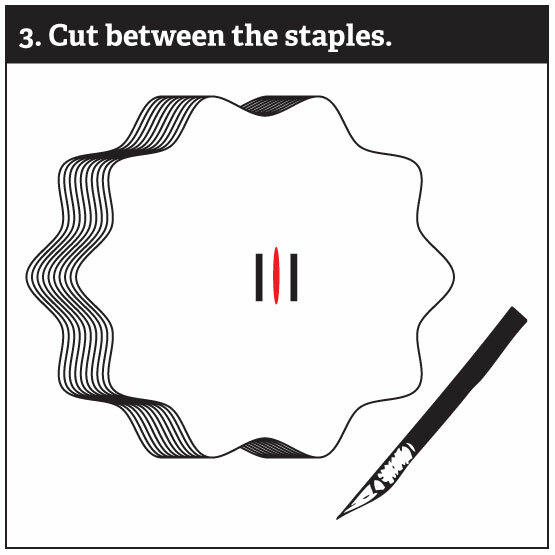 When you're done with the middle, start doing one layer at a time with the same method. Work on half then flip and work on the other side starting from the middle out again. If you mash the middle sections down to easier scrunch the outer layers, that's fine, when the entire ball is scrunched, you'll be fluffing it out to shape. NOTE: As you can see I did these without stringing them first. Don't do that. This was purely for the example of making the pom-pom. The next two posts on this topic will include COLORING and INSTALLING at your location. Very clearly explained! I really appreciate the zoom ups and all! Don't tell you made all those in the photo up there!! If you did, I hope you had help! THANKS! I'm glad you liked the instructions. Wasn't sure if it was over-kill but since my last posting on this, people seemed to want some more information on it. How did you get them purple? Did you dye them, or spray paint? THANK YOU so much for posting these!! I have been looking for a more cost-effective alternative to paper lanterns, and I think these along with some white lights may be the thing! Do you have the post on installing them?? I was curious about the hula-hoop technique....sounds very interesting, and may save a lot of work if it can work in our tent! 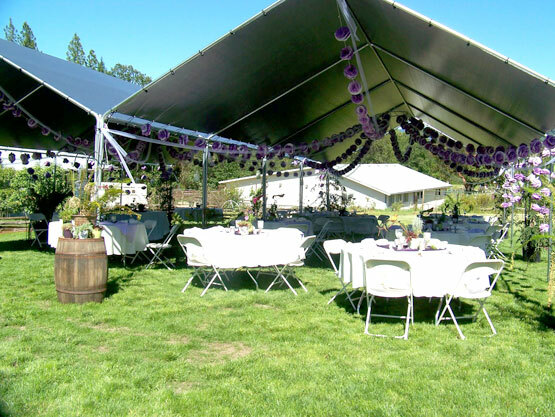 We'll be having a huge 40x120 tent, so I was thinking maybe around the center poles somehow?? Another question...did you mention putting the dye in the wash machine does not dye the washer that color? I thought I remembered reading that, but just wanted to make sure before I dyed our washer coral! I'm so glad you found this useful! :) I am a little behind schedule on getting the colouring and installing posts together but plan on them over the next two weeks. Is this something you need immediately? The hula hoop method worked fantastically! You CAN put dye in your washer. Most any dye anyway. It won't dye it! hah - it's scary to do that the first time, believe me. I'm not certain dying the coffee filters IN the washer is the best idea though... because of the quantity you have to work with. Really, you might want to get ahold of a 5gallon bucket or two or huge soup kitchen size pots....? Did you see the previous post on this? There is an image of the dying "vats" and the dryer. How we did it. I will cover this again in hopefully a more precise manner on the next post with using color. I will be using an array of pinks and fushia's. Sorry for the late reply! Our wedding is June 11th.....so I was hoping to get these started fairly soon to space out the work load a bit! :) I have read the previous post--great pics!! Just wondering if there's a link to the most recent directions on coloring?? Also, did you dye the filters first, then do the water/drying technique or vise versa? Just wondering if you had the next two posts up (coloring and installing). I couldn't seem to find them. I am getting ready to start these for my upcoming July wedding and would like to take a look at your tutorials. They are awesome! I hope my pom pom garlands turn out as good as yours! So...I have the coloring and assembling done (whoo hoo!) Just started the stringing and scrunching. 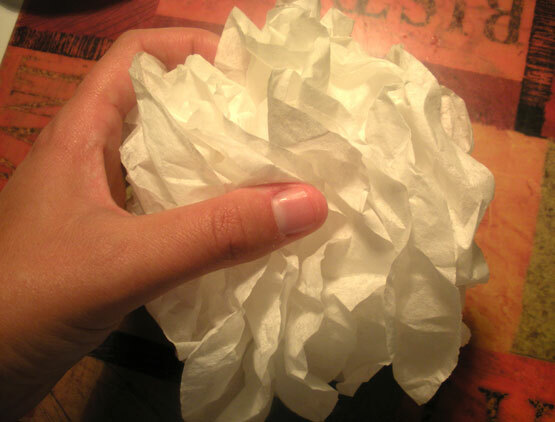 The scrunching has been VERY time consuming....was it the same for you? Any shortcuts? Also, any ideas on how to store these until the big day without crushing the poms and keeping the strings neat?? Can anyone tell me where to find the next two posts on dyeing and installing? Hi MichaelaGraves - they were never completed (for various reasons). I am hoping to do these (and I only need a small amount) for a bridal shower in late April so I have some time. I've read the original post, and was planning on following the directions there, but was wondering if there were any follow-ups/improvements to the dye process. I know in the first post you dyed and then transferred to the dryer making it easier to scrunch them. Here, you wet and dry them out before dyeing. I'm assuming if you plan on dyeing and then drying in the dryer you can skip this original step you posted here. Thank you so much for such a great project! 1. To achieve a "great scrunch" you will need to have the pom-pom's wetted and dried in the dryer at some point. Be that because you are dying them or leaving them white. Remove them from their packaging, separate them, toss them in the bucket of dye - depending on your container size, not more than 35-50 at a time in a 25lb bucket. 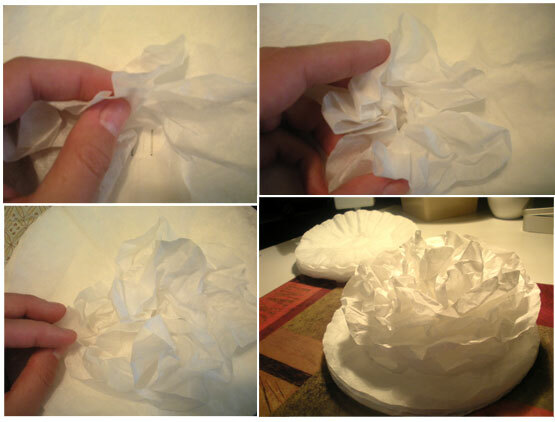 Ring, spread out and toss in to the dryer (filters are really tough so don't worry about tearing them). So the same method as the top instruction, only instead of spritzing them with water, you are actually tossing them in a vat of it (like the previous post). So yes, you have to do this before hand. 2. Just buy one dye color (wouldn't buy the petal pink Rit Dye as it's SUUUPER light and they might still look white when you're done). If you want different hues of the same pink to create a sort of ombre effect, time your dying batches and keep track of them. Less time for lighter pink, more time for darker. 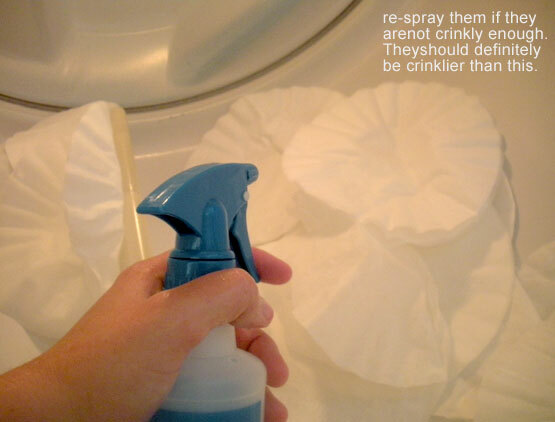 If after drying they still seem too light, toss them back in again. A note to keep in mind though, after dying a lot of filters the dye is going to start to "lose it's flavor" - and weaken because it is being used and soaked in to the filters of course to dye, so your dye time may need to adjusted. You may want to dye the heavier colored ones first, so that they take in the richness of the fresh dye pot and then the lighter ones last. There are some other fun ways to add color that I had wanted to showcase - Last year it got too late in the season and I was hugely pregnant (hahah) hence I just tried to help everyone over email, etc.